Configure Fedora Core 4 After the First Boot. The first boot up screen (after the installation process of the Fedora Core system to hard disk complete) is the GRUB menu. 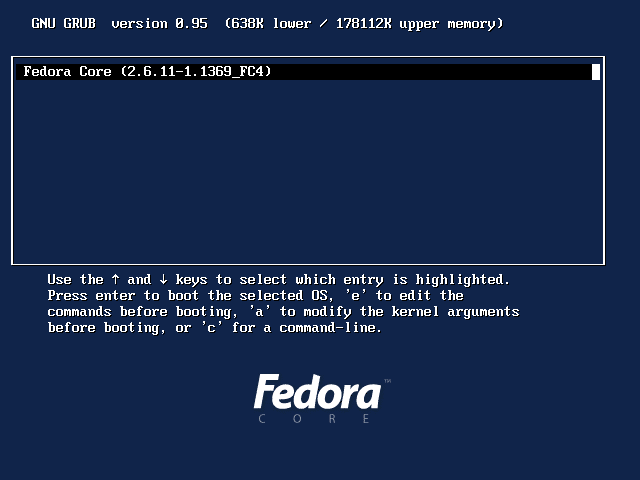 After GRUB finish boot the Fedora Core kernel, the system installation then proceed with the more configuration before the system can be use. The configuration include: verify the Fedora Core 4 License Agreement, set Date and Time for the system, configure Display screen resolution, set new User Account, configure Sound Card, and Additional CDs if you want to adding more software to the system. 1. When the computer is booting, the Grub boot manager will prompt for which operating system is wanted to be loaded. Press any key to enter the boot menu or wait for 10 second to load the default operating system. 2. If you have more than one operating install, Grub screen will display the list of operating system. Use the up arrow key or down arrow key to highlight the selected operating system, then hit the enter key to boot the selected operating system. 3. After finished loading, a welcome screen will appear. 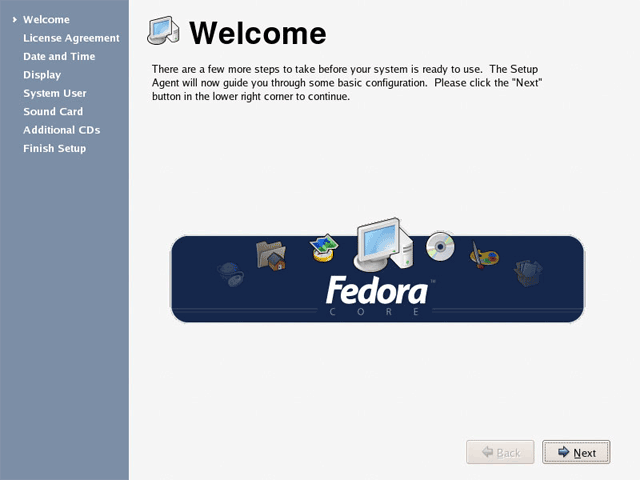 Due to first time using the system, Fedora Core will display a welcome screen. Here user prompt with basic configuration to verify the Fedora Core 4 License Agreement, set Date and Time for the system, configure Display screen resolution, set new User Account, configure Sound Card, and Additional CDs. 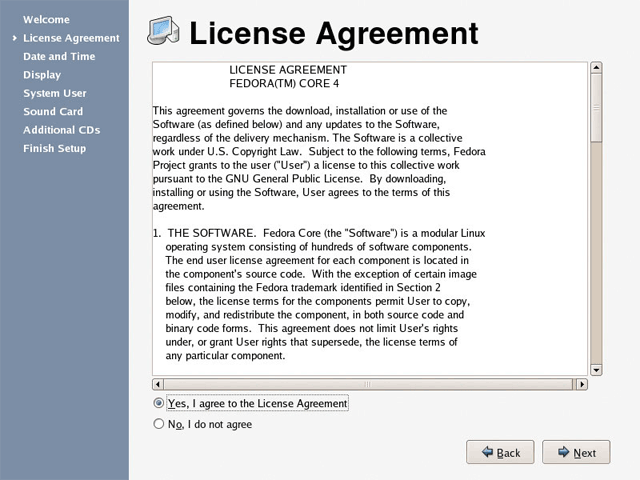 Click on the radio button that say "No, I do not agree" if you not agree with the License Agreement of Fedora Core 4, the Question box prompt for you to, consider to read the License Agreement or you can Shut Down the computer and remove the Fedora Core from the system. Note: You cannot install the Linux Fedora Core if you not agree with the license agreement for Fedora Core. 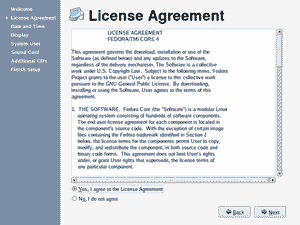 To continue with the installation, click the radio button that say "Yes, I agree to the License Agreement" to agree with the License Agreement of Fedora Core 4 and then click [Next] button to proceed with the Date and Time configuration process. 5. 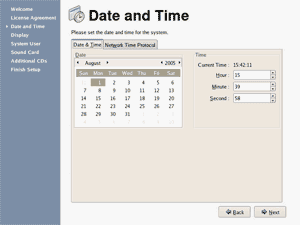 Setup will ask for the current Date and Time for the system. 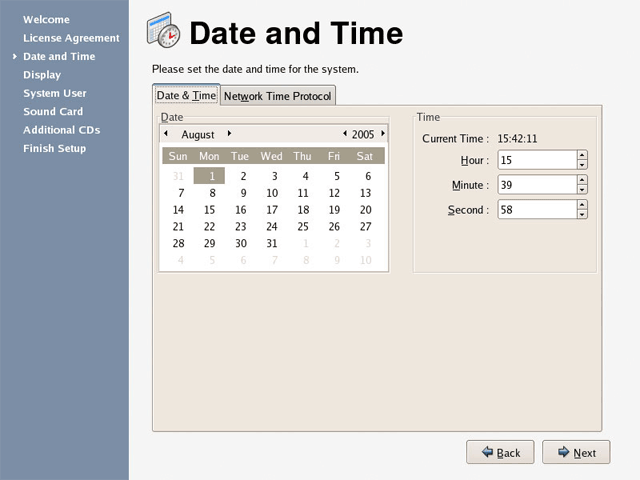 Enter your current time and date for the system manually or if your computer have an internet access you can synchronize your system clock with a remote time server using the Network Time Protocol, click on the Network Time Protocol tab and configure setup to enable the Network Time Protocol. Click [Next] button to proceed with the Display setup process. 6. On this setup Display screen, click on the [Configure] button to select the model of the monitor that you use on the system. 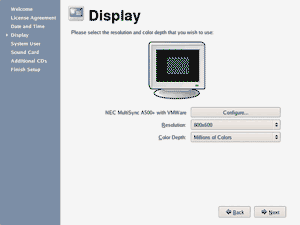 Then click the [Resolution] and [Color Depth] button to configure the screen resolution and color depth base upon the capabilities of your monitor. 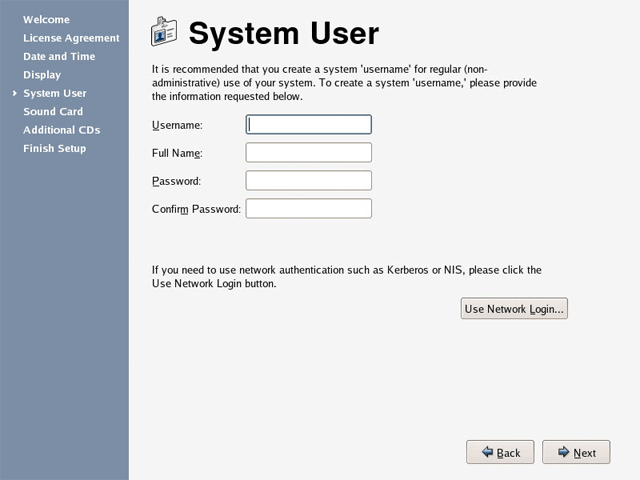 Click [Next] button to proceed with the System User setup process. 7. The System User screen prompt you to create a user account on your system. This user account is an regular user account (non administrative). To create this user account you need to key in the Username, Full Name, Password and Confirm Password (retype the password to ensure that it is correct ). 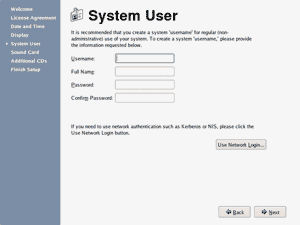 This user account (username and password) can be use to log in into the system as an user to the system. 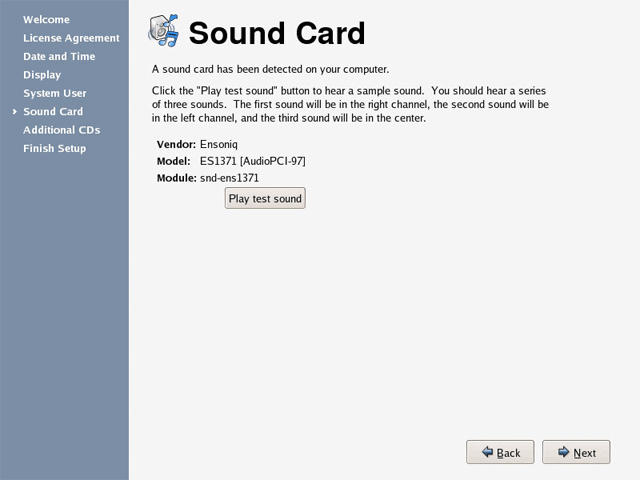 Click [Next] button to proceed with the Sound Card setup process. 8. The setup agent then display the screen of Sound Card. 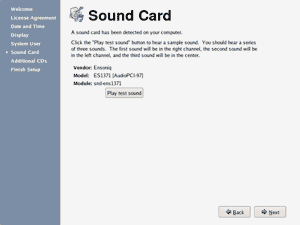 The system inform that the sound card have been found on the system, click [Play test sound] button to hear sample sound to confirm that your sound card working properly on the system. Click [Next] button to proceed with the Additional CDs setup process. 9. The setup agent then display the screen of Additional CDs. The setup agent prompt for additional software installation CDs that you want to install on the system. If you want to install any additional third-party software to the system, put the software installation CD on the CD-Rom drive and the click the [Install...] button to install the additional software on the system. Click the [Next] button to proceed with the setup process, if you do not have any additional software CDs . 10. The setup agent then display the screen of Finish Setup. This screen display that you have complete the setup procedure and your system is ready to use. Click [Next] button to Finish the Setup process. Note: Graphical login screen for Fedora Core only appear after you finish setting up Fedora Core 4 for the first time. All Fedora Core screen shot publish here are for educational purpose only. Suggestions and comments to improve this page or may be on the Fedora Core screen shot are welcome. BACK: Fedora Core 4 Installation Process Start to install Fedora Core 4 to Hard Disk. 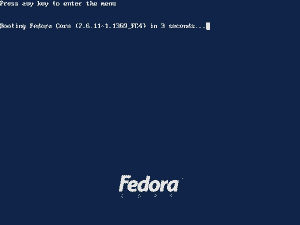 Keywords: fedora configuration screen, verify Fedora Core, fedora License Agreement, set fedora Date and Time, configure fedora Display, fedora screen resolution, fedora set new User Account, fedora configure Sound Card, fedora Additional CD, configure fedora core.